They floated in a thick, dark sauce. The nails had been cut off, but the rest of each finger stared back at me without eyes from the plastic plate, livid in vinegar. Truncated joints just below the feathers’ line. As I kept staring at my prospective dinner, I wondered how low a man can go to impress a pretty girl. Her eyes were inquisitive windows open on her own world. A slot machine of emotions tilted inside of her head, trying to spit out the appropriate row of words to describe me as delusional. When she invited me out to try some of the best street food in Penang, she probably trusted me to be a different, more interesting date. In Italy, chicken feet are not popular. They are not food. They don’t even appear at the poultry meat section, unless you buy a freshly slaughtered chicken. They get cut and thrown away as trash. As I approached the soft, darkly simmered meat with chopsticks, my mother’s voice came abruptly in from a lost corner of my memory lane. I had to trust her. They couldn’t be so terrible, after all. I looked at my companion profile against a backdrop of sizzling pans and rugged Chinese limbs which rotated in and out of steamy pots. Her attention was completely fixed on my next move, keeping the final verdict tightly squeezed behind stretched lips. My idea of a romantic after-dinner stroll at the seaside was suspended between the plastic extension of my right thumb and index fingers, a soy-sogged poultry mutilation, and her candid foreign perfection. The virgin taste of tender slime melting in my mouth slightly surprised me as I found a bunch of tiny bones between my teeth. “Spit them out on the table, it is OK,” she instructed me gently, savoring her relief at not having chosen a cultural idiot as a prospective boyfriend. I unleashed an awkward garter belt of unexploded chicken bones against the orange plastic of the table without injuring anyone. The delusion had vanished from her face. Shaking my head, I realized I just had my jackpot: a row of three Sevens, straight from the deep of her heart, started to fill the coin hopper that was standing empty between us until a minute before. 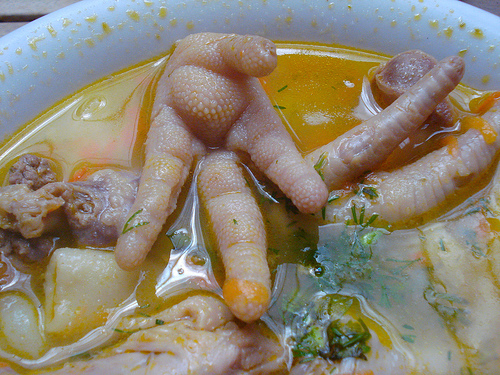 Wow, what a picture of chicken feet, plus the chicken kidney in the soup. I guess not many westerners would regard it as food.